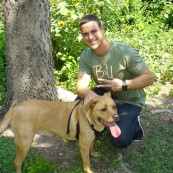 BGreaterThanU.com names Iraqi war veteran Dave Holt as their October Feature of the Month. Holt tells his story overcoming post war depression to college, volunteerism and as Big Brother mentor. Inspirational website B>U announces Iraqi war veteran Dave Holt as their October Feature of the Month. Holt represents the 'being greater than your self' spirit the website promotes. Holt was named October's feature out of his journey from war to depression to being a role model. Holt's B>U story started when he was medically discharged from the Army from combat wounds. He felt 'betrayed' as he sacrificed his personal life to serve his country. Holt returned to Texas not knowing what to do and became lost in depression and addiction. "I felt betrayed and discarded like trash. This life was all that I had and now they were saying I couldn’t have it anymore. It was the single lowest point in my life. I fell into a downward spiral. I never thought I’d make it out of alive," reflects Holt. Holt's family and friends rallied behind him to regain his purpose and he answered. Holt entered College, started volunteering for local causes and became a Big Brother mentor. Holt began his full-time student life with a 4.0 GPA, joined the lacrosse team and elected business fraternity pledge president. "Holt's individual journey overcoming his worst moments of life then spending each day becoming a greater person is the archetype of the B>U spirit," comments B>U Founder Matt Evans. "It is for that reason, we designate Dave Holt as B>U's 2014 October Feature of the Month."